Today we take a look at the final blend from Azan, the Maduro Natural Campana by Roberto Duran Cigars. This Azan Natural Maduro Campana is a 5 1/2" x 52 ring torpedo covered by a seamless maduro colored wrapper that contains just a couple smaller veins. Checking cold aromas the foot yields notes of cocoa and rich tobacco while the free cold draw has a spicy white pepper taste. After toasting the foot, the initial flavors were a medium bodied mix of black pepper and cocoa. The pepper quickly fades as nuances of oak and molasses take control. 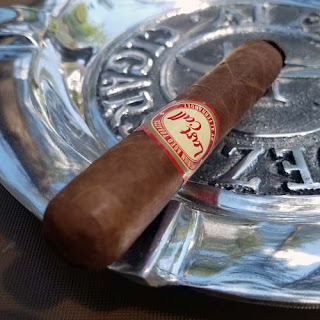 In the first half there's a sweet aftertaste that remains after each puff and the smoke has a dry wine type finish. By the second half, the body has moved into the full range and more flavors arrive. There were notes peat, earth, flora, cream, chocolate, lots of chocolate, and charred toast. As the sixty-five minute burn draws to a close the Azan Maduro Natural finishes with a flavorful mix of chocolate and charred toast. Overall this is another nice cigar from Azan Tobacco. It had a razor sharp burn line full length, it produced loads of smoke and had a solid flavor mix. If you run across one of these it's worth the time to try it out! I would like to thank Gabriel Piñeres of www.creativasgroup.com for providing these samples for review.